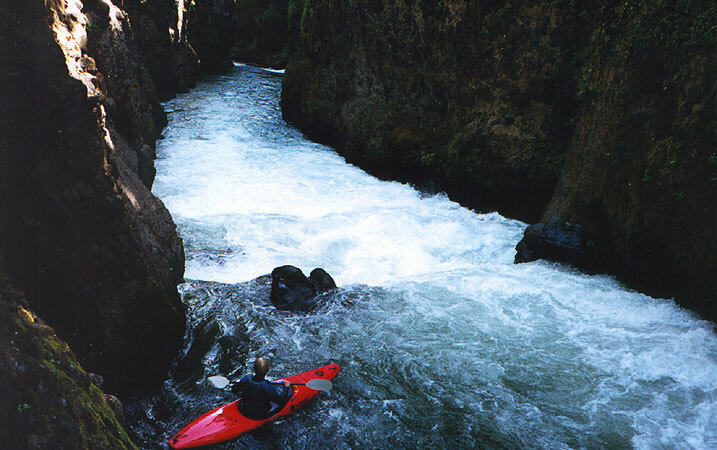 The Takilma Gorge section of the North Fork of the Rogue river is short but fun, with year-round flows and great rapids. The first time John and I ran Takilma was on a road trip in early June. We were in the area looking for some harder runs but we were a few weeks too late- Graves Creek was dusty and the Middle Fork of the Rogue was too low to enjoy. Surprisingly, the North Fork of the Rogue had plenty of water, and we found out later it always does this time of year. We ran the Natural Bridge section of the North Fork (a little known class IV run just above Takilma) in the morning with some locals and then lingered at Woodruff bridge take out, eating and soaking up the sun. We soon found that skilled local boaters flock to Takilma at this time of year because when the flows are above thousand cfs the gorge is one of the best runs in the area. The photos on this report were taken at ~1000 cfs. We had hiked the trail down from the bridge along the rim of the gorge the day before in order to scout all of the rapids. 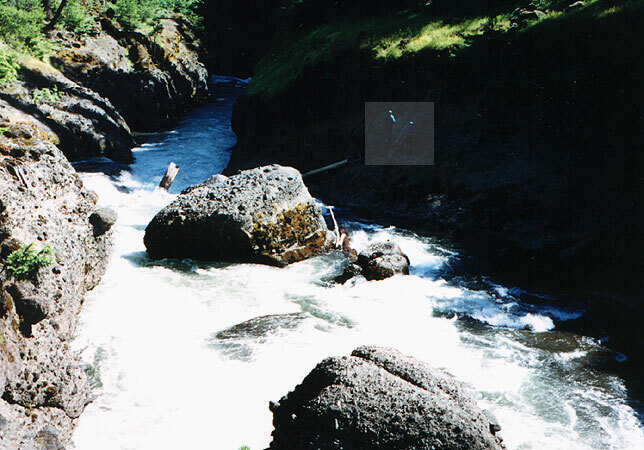 This is strongly advised because you can only get out of your boat easily in a couple of places in the gorge, so you have to know the lines ahead of time. As we later learned there are six major drops in the gorge- The first is named Entrance and the others are numbered consecutively one through five. When you are peering down into the gorge from thirty feet up it is difficult to estimate the size of the holes- stuff that looks inconsequential from above certainly doesn't feel that way when you are in it! Next up was Number Two, a relatively easy drop that pushes against the right wall a bit. Below Two the river slows a bit above Number Three, which is complicated by a riverwide log just above it. The log can be portaged pretty easily through the huge undercut in the wall on the right. Below the portage you launch directly at the top of Number Three, which has a few big boulders blocking the main flow and then a riverwide L shaped ledge. This ledge must be run either far left or right because in the middle of the L there is a large pothole/cave that has been explored by a few paddlers. There is currently a large log vertically pinned in the pothole, so you know exactly where NOT to go! Below here is another pool above Number Four rapid, which was difficult to scout from the top of the gorge but can be scouted (but not portaged!) from river level on the left. We were a little worried about this three part drop because it has a couple of powerful holes at this flow that looked pretty unfriendly. The top part of Four involves sneaking around a violent hole on the right side and then paddling hard at the bottom to punch the last hole especially. A swim in Number Four would result in a long swim through the rest of the gorge (and rapid Number Five) as the walls are totally vertical here. John boofs past the top hole on Number Four. Locals say that at lower flows the best line is to boof the right side, but at this flow that would likely result in a bit of a thrashing. John in the eddy above the last double drop on Number Four. This photo doesn't do these drops (and the river-wide holes below them) justice, especially the bottom one- John got a big back ender in his Overflow X when he ran it, so punch em' hard! The entrance to Rapid Number Five is just visible downstream. Number Five is next- this one was pretty fun with some twisty moves through some big hydraulics and then we were floating downstream below the gorge. This run was a lot of fun and is definitely worth doing if you are in the area. It is rated IV+ but it has a class V feel because a mistake or a swim could turn ugly in a hurry. A local paddler told me later about a boater who got worked hard in one of the holes at Number Four and swam the rest of the gorge including rapid Number Five. He said that guy never got in a kayak again because he was so traumatized. 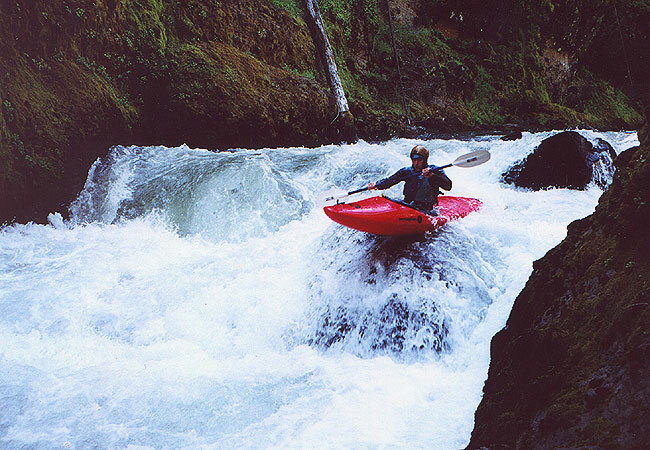 Because of this I personally think this run is better suited for paddlers who are used to paddling harder whitewater rather than the other way around, especially at higher flows. 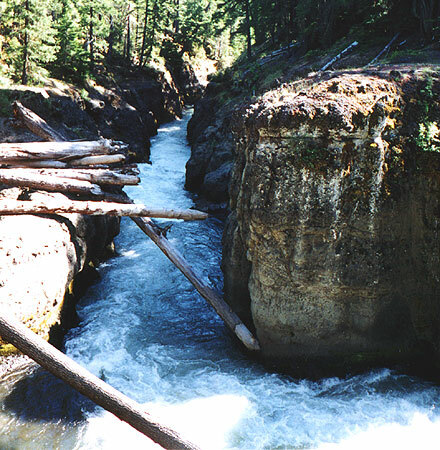 Flows: Takilma runs year round, but it's character changes dramatically with the water levels. Always scout this section from the wall of the gorge BEFORE you put on as there is no way to scout or portage several of the larger blind drops once you are on the river. Also, check out this very cool clickable map for the Rogue basin that shows reservoir levels and realtime flows at all of the gauges!